MyMemories Blog: Creating an Album using Quick Pages with Syrena's Scrap Arts! Creating an Album using Quick Pages with Syrena's Scrap Arts! When I look through my personal paper scrapbooks the one thing that stands out to me is that each page is different from the next. I have made scrapbooks for my kids and grandkids and each page is unique and tells a story. Some pages are two page spreads and some are single pages. Each one unique, created over time as I collected the images of our families memories. I started thinking about how I would do a digital scrapbook for printing and for me I want mine to have the look and feel of the traditional scrapbook, as is evident by my digital designs. When I began digital scrapbooking I could not find what I wanted thus I started making my own. In doing that I found it was very time consuming. However, it did lead to me doing something I absolutely love doing. It seems everyone is busy today, life is just zipping past us all. So if you want to create a quick and beautiful album why not use quick pages? They are so easy to use and you you can quickly and easily add photos, journaling, titles and even extra elements to them. And by collecting them as you go you will create a wonderfully engaging album with something new at every page turn. Come on over to the My Memories Shops and see all the wonderful Quick Pages available! And if you are looking for the traditional look of paper scrapbooks come on over to my shop I have lots of Quick Pages, I love making them. 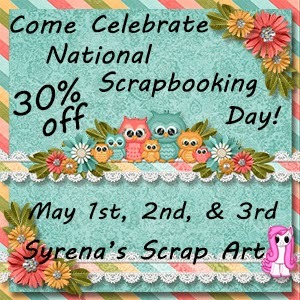 Enjoy 30% off Syrena's Scrap Art in the MyMemories Design Shop!